I am not sure if I have ever mentioned this before, but I am the Committee Chair for my sons' Cub Scout Pack. Cub Scouts is designed for boys in the 1st-through 5th grade. February is the anniversary for Scouting, and this is celebrated by Packs everywhere with a Blue and Gold Banquet. It is sort of like a huge birthday party for cub scouts. 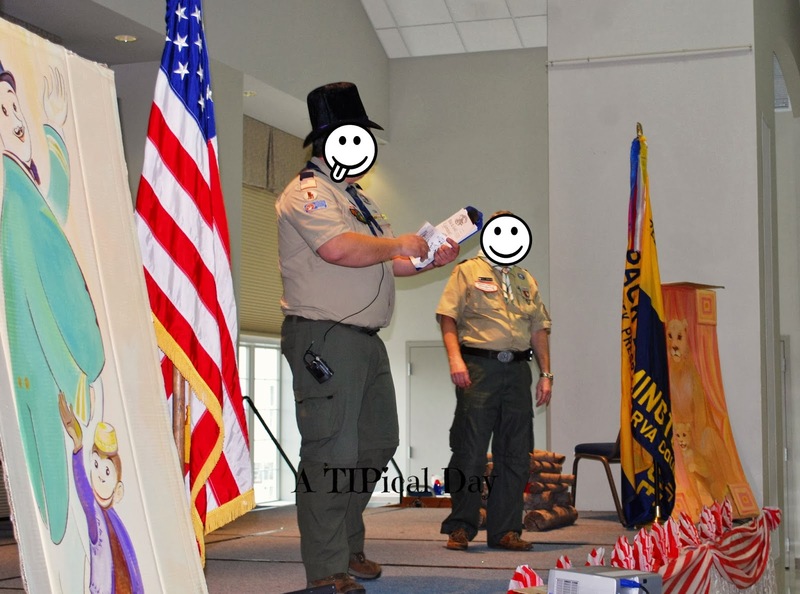 Most Packs will also have a crossover ceremony at the banquet for their Webelos II (5th graders) who are moving up or "crossing over" into Boy Scouts. So as you can imagine, those in the Cub Scouting world are all a buzz right now about the Blue and Gold. 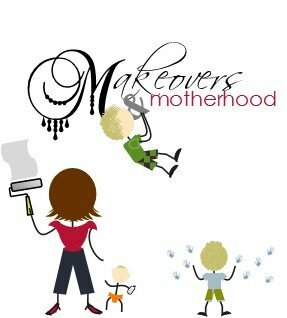 As a result of my position, I am pretty heavily invested in picking out a fun theme for our banquet each year so I thought I would share some ideas for themes. Here are three that my Pack has done. 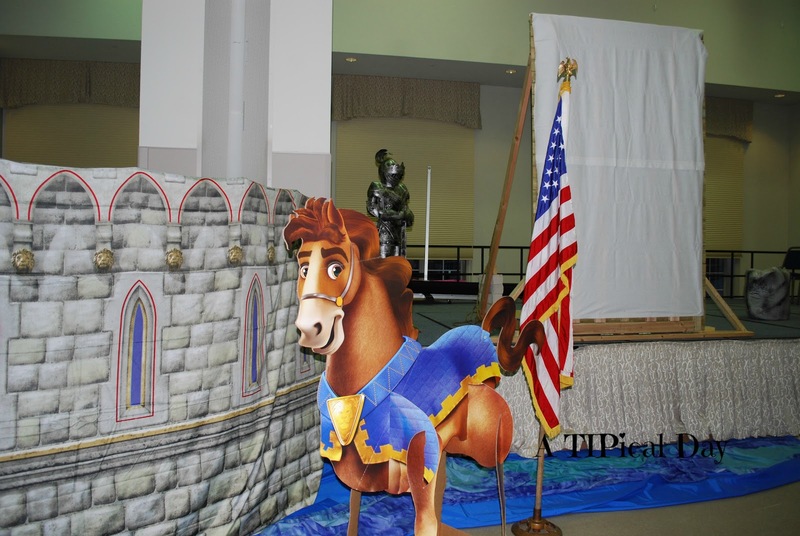 Knights of the Round Table Blue and Gold - Last year our Pack had a fun Knights of the Round Table Theme. This Blue and Gold was complete with our drawbridge that opened for our crossover ceremony! Be sure to go read about it here. Circus Theme - A few years ago our Pack did a fun Circus Themed Blue and Gold. Our decorations were red and white bunting, and red and white fabric along the walls to make it look like a circus tent. We also had lots of balloons and some cute cutouts of circus animals around the room. You can see some on the stage in the picture below. 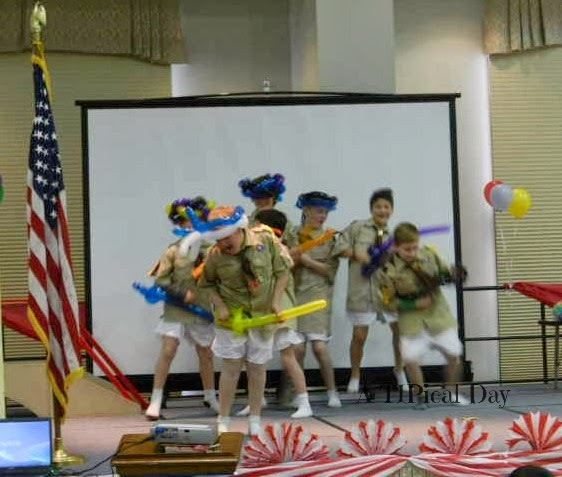 I don't have any pictures of the centerpieces, but the Scouts made them using a plastic popcorn tub from the $1 store and put all kinds of candy like huge lollipops and gum balls, pictures of circus animals, their own hand prints cut out and pasted to twisted straws, and some had balloons tied into them. They were very fun and whimsical. It fit the theme very well. A clown walked around the room showing the boys a few tricks. We also had a station for balloon animals and another for face painting and in the very back of the room we had one of those clown bells that you hit with a hammer. Our Cubmaster even grew a handlebar mustache and wore a top hat for the evening. For dinner we provided fried chicken, and each den brought the various side dishes. For dessert we provided ice cream cups and held a dessert auction. The auction was a great little extra fundraiser and the adults really got into that! The only problem was that we actually had to cut it short due to time, so if doing your own, plan a lot of time for it. I think we had only reserved about 20 minutes, but probably should have done more like 45 minutes. For entertainment each den was asked to preform a circus side show skit. We had so much fun with these! Something I will write about at another time is our popcorn fundraising. I have been the "Popcorn Kernel" for the last 4 years. We always do really well, and one reason is our prizes! We give a prize to all the boys that sell over $1000, a ride in a limousine to the Blue and Gold. They always love this. 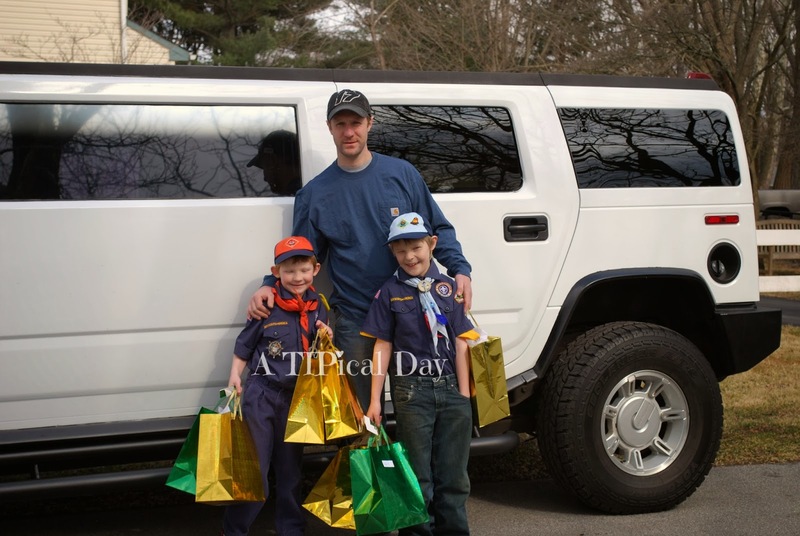 Each boy in the limo was given a gift bag with some fun circus themed items. I think we had 8 boys in the Limo this year. 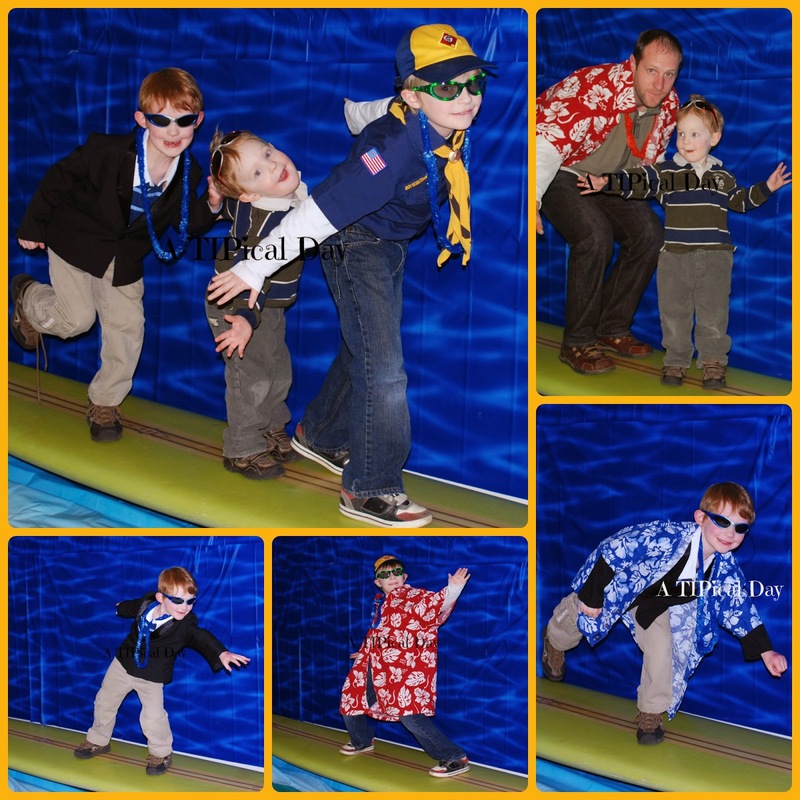 Hawaiian Luau - We have also done a Hawaiian Luau that was a huge hit! My camera was being used for our photo booth, so that is all I really have pictures of from this one. For the photo booth my dad came up with the genius idea to put an old surf board on some cinder blocks and tape up some water backgrounds! This was the star of the event! Everyone, even the adults, were coming over to get pictures done. After the event I printed the pictures up for everyone and handed them out. We also had some large straw hats and big Hawaiian shirts that people could wear for the pictures. Everyone got a pair of sunglasses and Hawaiian leis. 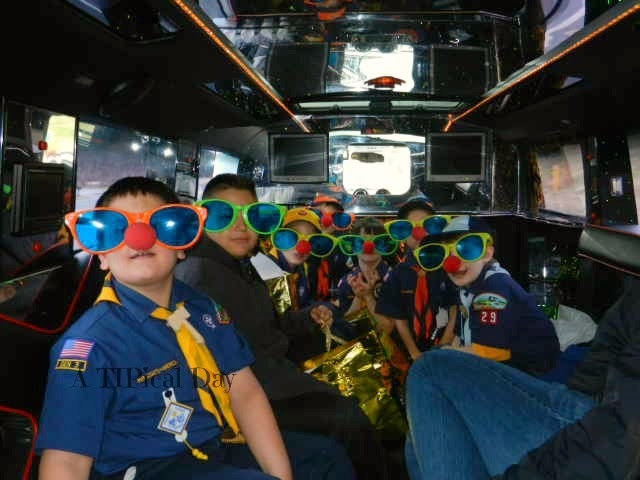 The boys in the limo this year got special light up glasses. We had tiki totem pole posters that got taped up on the stage and palm tree posters got taped up around the room. 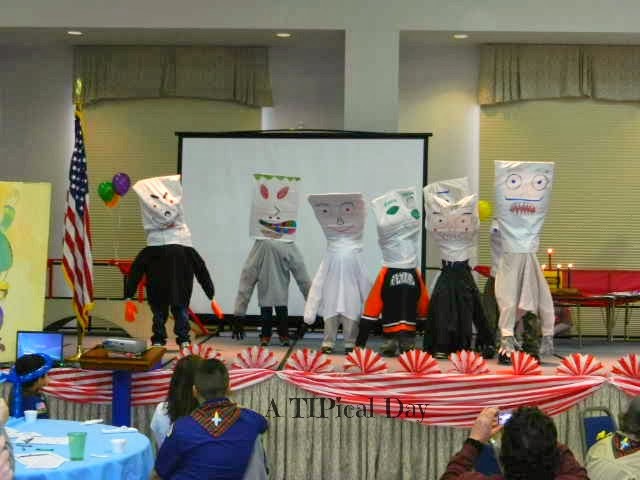 The centerpieces were all made by the Scouts. They were boxes that had been decorated with Hawaiian phrases and pictures. Foam flowers got scattered about on the table tops for an extra touch. The food was catered and included items like coconut shrimp, Hawaiian chicken skewers and pineapple rice. I will admit that although DELICIOUS, the food put us way over budget. Really pay attention to this if you are going to have your event catered. It adds up pretty quickly. For an extra little fundraiser we did a basket raffle with donated gift baskets. This actually made about $2000 so it was a good one if you can get some good gift baskets to raffle off. This year we are doing a Jungle Theme, and I will share about that one in a few weeks after the event. 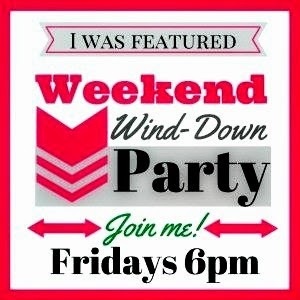 These are all great themes and I appreciate that you shared and linked up with us at the #WWDParty. Enjoy the rest of your weekend. I love the idea of raffling off gift baskets! Last year, I did Blue and Gold with another parent. This year, I'm helping but not on the committee. I will pass along that idea.